Over 360 supporters from many different backgrounds crowded into the ballroom of the Nessah shul in Beverly Hills to celebrate the completion of 13 years of Torah study and community outreach of the Los Angeles Intercommunity Kollel (LINK) on the evening of May 18, Rosh Chodesh Sivan. 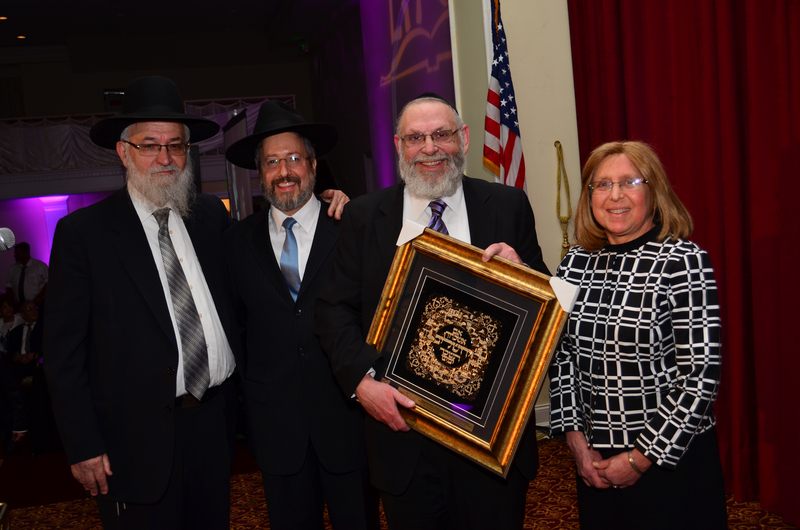 The gala anniversary dinner also honored two prominent community couples: Rabbi and Mrs. Ephraim Niehaus, a beloved, veteran M’chanech and now part-time Avreich at LINK, and Dr. and Mrs. Roy Blumenstrauch, leading supporters of Torah institutions across Los Angeles. LA. From those modest beginnings, the Kollel has burgeoned into a major force in the Pico-Robertson community, where it relocated in 2011. It now employs 16 full and part-time Talmidei Chachomim who both learn amongst themselves and teach hundreds of students of all ages and backgrounds every week. On this night, Rabbi Brander’s prescience was clearly vindicated as the community of students and supporters turned out in force to celebrate the achievement of LINK’s milestone anniversary. In his remarks, Rabbi Brander paid tribute to the avreichims’ “love affair” with Talmud Torah and their mesirus nefesh for learning and teaching from 6am until 10pm daily. He analyzed the progression in the wording of the Birchas HaTorah that we recite daily. When we study Torah in depth, it brings us to true joy and delight, which in turn inspires our children and our students to follow in the path of Hashem. Rabbi Brander proceeded to explain why Dr. Blumenstrauch was so worthy of the Community Leadership award. He noted the dedication that Roy and his wife have put into the chinuch of their children, their quiet chesed on behalf of many as well as their leading role in the founding of several Torah institutions (in addition to their steadfast support for LINK from its inception). Dr. Blumenstrauch in turn thanked LINK for all it has done for his family. He hearkened back to the searing lesson in Jewish continuity that he learned from his late parents who survived the gehinom of the Holocaust and built a new life, first in Israel and then in America. In particular, he related how his mother, who miraculously escaped the concentration camps while on the run form the Nazis, was shocked and ultimately heartened when she realized that she and her family were not the only Jews left in Europe after the war. She inculcated the imperative of Jewish continuity to her son, which has motivated him to this day. Following an inspiring video presentation about LINK and another one about Rabbi Niehaus, created from interviews with his former talmidim, Rabbi Shalom Tendler, Rosh Yeshiva of Mesivta Birchas Yitzchok, presented Dr. Blumenstrauch with the Distinguished Harbatzas HaTorah award. Rabbi Tendler had been Rabbi Niehaus’ Menahel for most of the latter’s 35 years in Chinuch at YULA High School. Rabbi Tendler called Rabbi Niehaus the quintessential “Ben Torah.” A son, he averred, reflects the essence of his father. A “Ben Torah” reflects what Torah is all about. This, he concluded, is the ultimate compliment to Rabbi Niehaus, since he has been such a warm and compelling role model for his hundreds of talmidim throughout the years. In a deeply-moving gesture of Hakoras HaTov, dozens of Rabbi Niehaus’ talmidim in the audience came up onstage to personally thank him for all that he has done for them throughout the years. In his acceptance speech, Rabbi Niehaus explained how the ten Dibros were uttered at once, meaning that ultimately, they all have one source: Hashem. “Indeed,” he continued, “Chazal say all 613 mitzvos were hinted at in these 10 Commandments and thus all of them are ultimately from one shoresh – the will of Hashem that we must dedicate ourselves to unconditionally.” He concluded by reflecting on the various stages of his life: His years as a yeshiva bochur, yungerman, busy father, his career in chinuch, and his recent move back to Kollel after so many years. He exhorted his audience to remember that if a person makes Torah study his focal point throughout his life, regardless of whatever he may do for a living/parnosa, then when he retires, his return to the Beis Medrash will be effortless because he never really left. With those powerful words, LINK’s most successful banquet to date concluded, leaving its audience deeply inspired and poised to accept the Torah anew on Shavuos, a mere five days away.